johmegli0 has no other items for sale. 1866 Shield Nickel, Re-Punched Date, Tough XF Better Date, Rays! 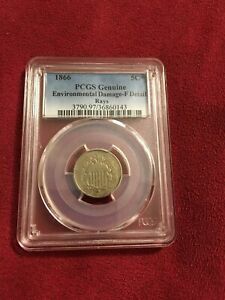 1866 SHIELD NICKEL WITH RAYS SCARCE VARIETY looks better in person! Old coin! 1866 Shield Nickel, Rays, Very Nice Choice BU++ Better Date!